Canon is shaking up the digital camera community with the release of its newest affordable SLR. The 20D features an additional 1.9 megapixels over its predecessor, yielding a large 8.2 megapixel output. The camera design is a bit different as well with support for EF-S lenses that can provide a wider angle of view. The 20D has a new 9-point auto-focus system compared to the 7-point system seen on the 10D. The 20D promises to provide lower noise than the 10D at higher ISO settings as well as a large speed improvement. In our review, we found the Canon 20D to be a great performer. Compared to the 10D, it is much faster in several ways. The camera is able to start up in just 0.23 seconds compared to the 10D's 2.39 second time. In many of our other timing tests, the 20D continues to outperform the 10D by a large margin. The 20D raises the bar by allowing continuous shooting at 5 fps for 20 frames in JPEG (Large/Fine) mode compared to 3 fps for 9 frames on the 10D. Although general image quality on both cameras is very similar, the 20D has a huge advantage when it comes to high ISO performance. At ISO 3200, the 20D produces images that are low-noise and rich with detail, while the 10D produces images with a large loss of detail and discolored pixels. 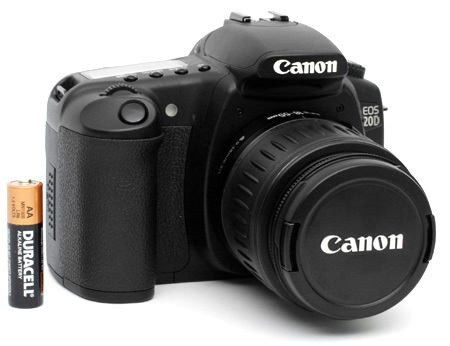 Read on to see all the details of our review of the Canon 20D.